Amaryllis always make me think of the work of Georgia O'Keeffe. That wonderful American artist who paints pictures of flowers - amazing flowers - flowers so big you could crawl inside them, like Thumbellina. The image of actually living inside a flower is so surreal, maybe even sublime. Just think. You would be surrounded by the exotic perfume, touched by the velvet petals and rocked by the gentle movements of the blossom.....Where can I buy my next ticket to paradise! I thought of the equivalent in knitting. I thought of little capelets of petals, draped over the shoulder or a calyx of a pretty collar, perhaps beaded here and there to suggest dew. Or perhaps a poncho done in something very soft and delicate or an afghan, again in something petal like. 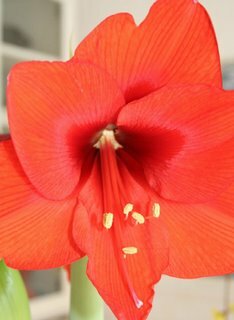 Add a little scent, open a window on a mild day and you are one with the flowers. Such is the magic of Art. It transports one to realms unknown, to experiences bey ond the ordinary. I have included pictures of Berry and Brick(a new shade) from Fiddlesticks Knitting Country Silk and smaller skein size (125g & 400m). These are the reds I remember from the flowers of Georgia O'Keeffe. 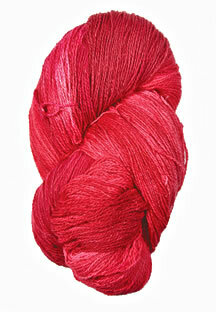 Paint(knit) yourself a floral wrap, with the amazing palette of yarns available to-day. Let your knitting transport you to new and wonderful places.